Solid chocolate Easter eggs are beautiful edible gifts that can be made without any special equipment. Eggshells are hollowed out and used as candy molds to produce these easy, delicious Easter candies. You can serve them in the shell, for a fun surprise, or remove the shell and decorate the solid chocolate egg with melted chocolate piping, luster dust, edible decorations, and more. Begin by preparing the eggshells. Take a straight pin or thumbtack and poke a hole in the bottom of an eggshell. Continue to work the tack around the hole, enlarging it, until it is about the size of a pencil eraser. Insert a toothpick or skewer and work it around to break up the egg yolk. Pour out the egg, using the skewer to help if necessary, into a container to save for another use. Repeat with remaining shells. Once all of the eggs have been drained, rinse the inside of the shells with hot water several times. Place the eggshells in an oven heated to 300 F for 10 minutes to dry them out and kill any bacteria. Allow the eggshells to cool while you prepare the chocolate. Chop it finely and place it in a microwave-safe bowl. Microwave in 30-second increments until melted, stirring after every 30 seconds to prevent overheating. Once the chocolate is completely melted and smooth, place it in a pastry bag fitted with a round tip (make sure that the tip is small enough to fit in the holes in the eggshells.) Alternately, place the melted chocolate in a plastic bag and snip off a small corner of the bag. Stand the egg shells up in an egg carton with the holes on top. Pour the melted chocolate into the shells, tapping them several times to remove any air bubbles. Make sure that you fill the chocolate to the top of the shell. Once all of the eggshells are filled with chocolate, refrigerate the carton to set the chocolate, for several hours or overnight. 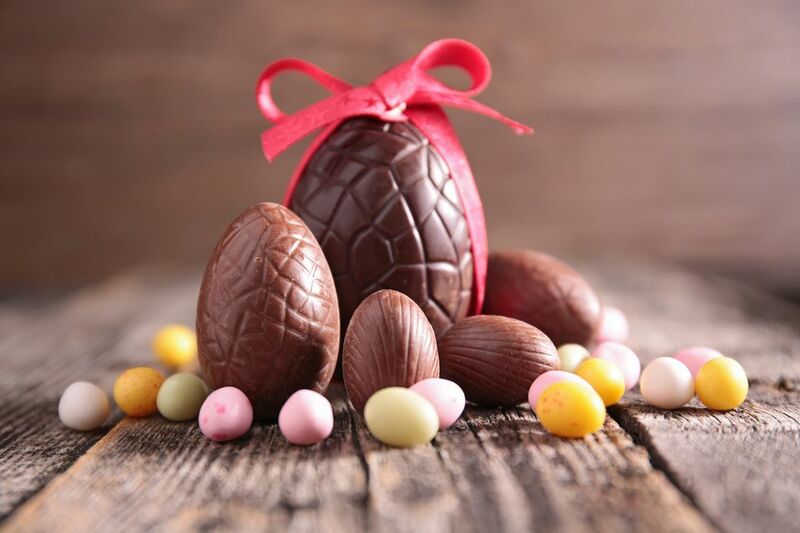 Once set, the chocolate eggs can be given as gifts as they are, or you can carefully peel them from the bottom and decorate them with melted chocolate, candied flowers, ribbons, etc. The eggs will become dull if exposed to the air for too long, and it is best to keep them in the refrigerator until shortly before eating them.